With Atletico Madrid winning and Villarreal springing a surprise victory at Real Madrid, the pressure was on us to get a result here and the team responded with a mostly decent performance to land three points. The line-up provided a few surprises. New signing Coquelin started, with Maksimovic at right midfield. Up front there was full rotation, with neither Vietto nor Zaza starting and Rodrigo and Mina taking their place. Another notable selection was at right back, with Vezo playing there instead of Montoya or Vidal. Vidal was absent from the squad completely and has clearly lost Marcelino's trust. The first half was a fairly even affair, with neither side creating many chances. Depor adopted the same tactics most teams take against us. Putting men behind the ball when we have possession and targeting our right back. They nearly scored in the 12th minute from a corner, though it would have been by luck. Their player missed a header, with the ball bouncing off his shoulder and on to the crossbar. Our main chances came from an active Guedes. In the 26th minute, he hit an excellent curling shot which the keeper did well to stop going in the top corner. Shortly after, he shot just over. After Depor having most of the best of the 25 minutes, Valencia exerted more control, passing the ball around patiently. A good move featuring Maksimovic on the right could have resulted in a penalty, as their player slipped and handled the ball when falling, but the ref judged it accidental. He was probably right, but we've had those given against us. Not to be outdone, Valencia took the lead due to good play by the forward three. Mina made a driving run, beating 2 Depor defenders, then finding his way blocked, wisely decided to pass to Rodrigo, who found Guedes in space and his shot beat the keeper, who should have done better. Depor headed just over soon after, but it was advantage Valencia at half time. The second half was mostly even, with Valencia defending solidly and looking more likely to score on the counter. Guedes was having a great game and was leading a counter when he was fouled for a yellow. But unfortunately, Parejo picked up a yellow soon after and will miss the next game. Valencia doubled their lead in the 64th minute with the same front three involved. Great persistence from Mina, robbing the ball, finding Guedes who passed to Rodrigo and the latter's shot was deflected past the keeper. 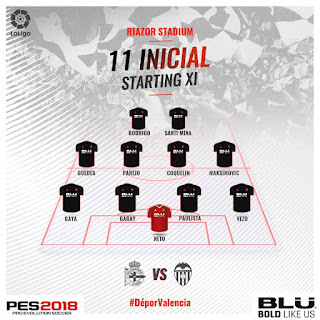 It looked more likely that Valencia would wrap it up by adding a third and the team tried. Rodrigo headed wide, Guedes shot wide.... it just didn't happen. 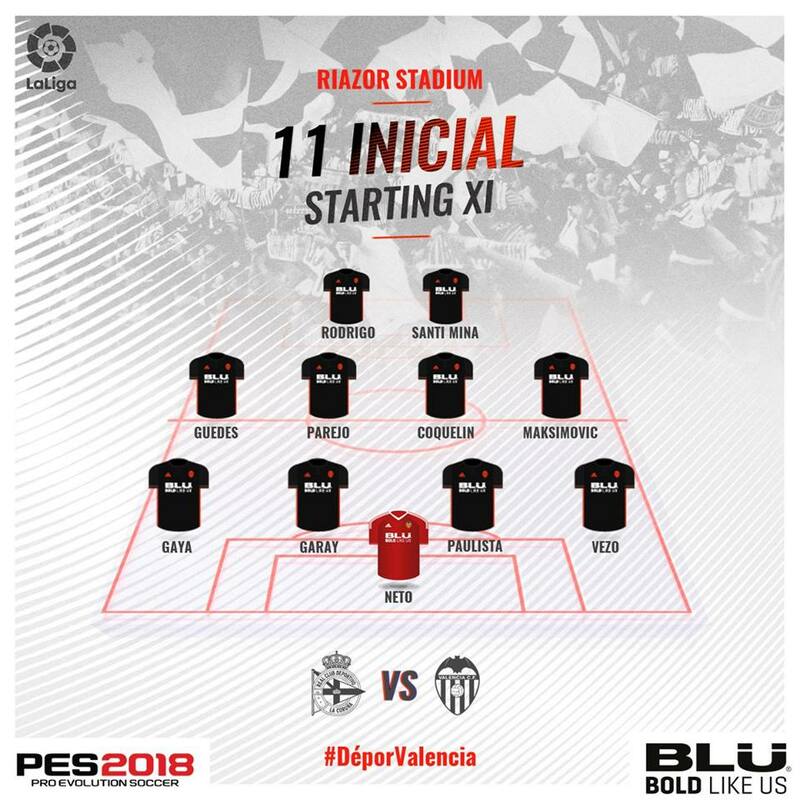 Marcelino changed the front two bringing on Vietto and Zaza. Despite Zaza's knee problem being clear again, he added to the attack and was unlucky not to hit the target. It should have been game over but the team nearly threw it away with a shaky last five minutes. A cross from our right side should have been dealt with by someone including Neto. It looked like Garay was pushed, but either way, Depor had pulled a goal back and we looked vulnerable. With three minutes of added time it was nervy. Adrián should have scored when put through, but one-on-one with Neto, shot over the bar. Then there was a last minute which I just didn't understand. Valencia had the ball at the side of their box with Vietto. Instead of just holding it up, we passed it around, lost possession and conceded a corner, which fortunately they couldn't do anything with. With the exception of that last period, this was a decent game, we should have put it to bed and I'm still not convinced by any forward two which doesn't feature Zaza. For all that, three points at a difficult stadium gives us our first away league win since 19 November, which was also the last time we won three in a row. Valencia ends the first half of the season in an excellent position, third, 8 pts ahead of R.Madrid (who have a game in hand), 9 ahead of fifth-placed Villarreal with Sevilla a full 11 pts behind and under pressure to win tomorrow's game. A great first half of the season and credit to all involved. Rodrigo 7 - did well, linking up well with the midfield and got his first league goal since November. Is now the team's top scorer this season with eleven goals.